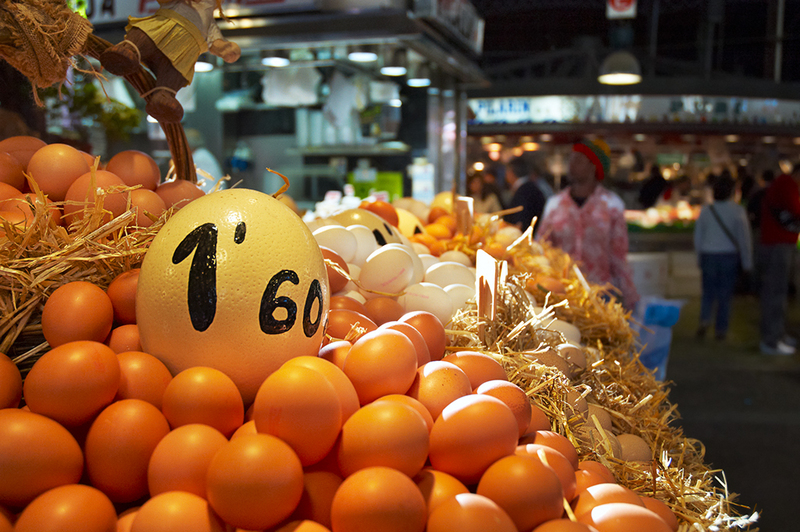 Illuminated by both the warm incandescent light of the bulbs and the pristine rays of the early morning Sun these eggs, so carefully laid out as they are, seem to draw the most attention in La Boqueria market. In my opinion, the egg stall is only second best to the fruit stand at the entrance. By the way, today it is starting to be slightly cold in Barcelona although for tourists coming from up North this must be a joke. Sooner or later we will be like little chicks looking for a warm shelter under Mommy Hen's feathers. I hate winter. I'm hungry for a yummy omelet! Warm & inviting...I love your market photos. It's getting cold here too, but when I mention it to my friends in the U.S...particularly Wisconsin, they laugh at me. Oh, I'm with you...winter needs to be abolished! Great photo. I am very curious, tho, about the unrefrigerated state of eggs I have seen in other countries. We in the US refrigerate ours, and I wonder why the difference?! Wonderful colours and crystal clear!